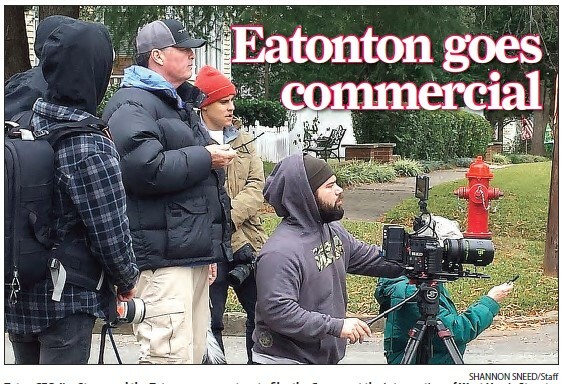 Tytan CEO Jim Stone and the Tytan crew are set up to film the Camaro at the intersection of West Harris Street as it comes toward them on North Madison Avenue in Eatonton. A dune buggy flies by in front of First United Methodist Church of Eatonton. 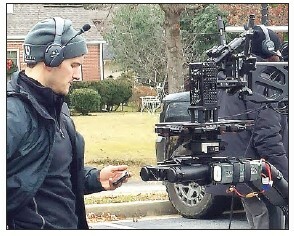 It is equipped all around with cameras and other recording devices. There are four technicians in it, and they are chasing a brand new Chevrolet Camaro SS. The Camaro is headed straight for a group of photographers set up with still cameras. Just before hitting the crew, the driver whips onto West Harris Street. That was the scene on North Madison Avenue last Friday when Tytan Studios assisted in the filming of a commercial for Chevrolet. Actor/Director Drew Waters, known for his work on True Detective and NCIS, directed the commercial. 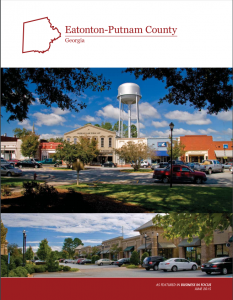 Ryan Haake, who starred as Steven Simmons in Tyler Perry’s “If Loving You is Wrong,” assisted Waters in filming the commercial. “It’s important to get the coverage,” Haake explained, noting that sometimes three great shots aren’t as good as 30 okay shots. Tytan CEO Jim Stone said the crew began filming early that morning throughout Putnam County. The producers took advantage of the view of the trestle on Willie Bailey Drive and filmed in that area along with several others. Eatonton Police Chief Kent Lawrence, along with several safety officers, were on hand to keep the area secure and safe, noting the Camaro was being operated by a professional driver. The cold, overcast day did not interfere with filming. Stone said the clouds created diffusion and made it easier to get some shots. “When it’s sunny, it casts shadows,” he said. The camera-carrying dune buggy flies by again — all by itself. “They’re getting the driver’s point of view,” Stone explained, noting they would also film the car from each angle as it speeds down the street. “A 30-second commercial can take 300 hours,” Stone said.